Carrots are versatile extremely nutritious and tasty vegetables. They are also so commonly available we are likely to take them for granted. If you're used to orange sticks - big or small - from the grocery store, a farm-fresh carrot may well be a revelation to you. They are sweet and tender, full of flavor and crunch, and famously full of beta-carotene and vitamin A, as well as soluble fiber. Wait, you find yourself asking, there's a carrot season? Well, yes. Carrots are obviously available year-round in North America, and are harvested year-round in temperate areas. 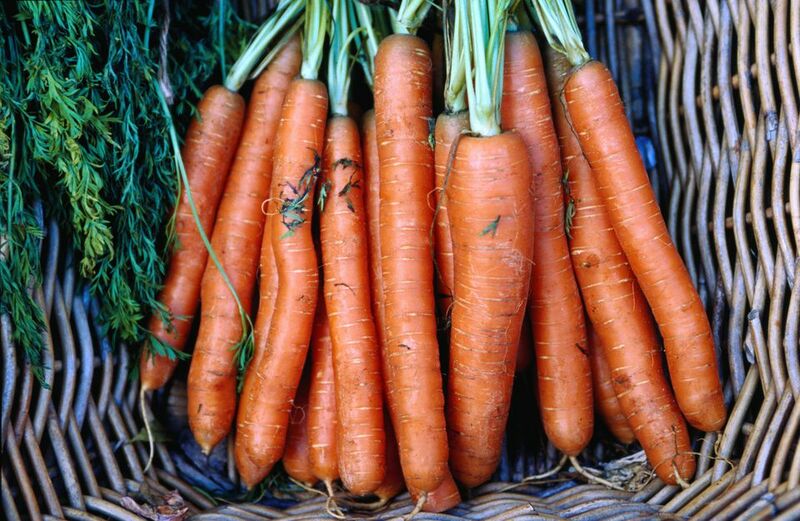 Unusual varieties are harvested during the carrot's natural season, however, which is late summer and fall (with true baby carrots - not the milled down versions of regular carrots sold as "baby carrots" in bags at grocery stores - available in the spring and early summer). They are often available from storage through early winter in colder climates. Carrots: They're not just orange anymore. Look for golden, white, and red carrots at farmers markets and specialty grocery stores. Carrots are second only to beets in sugar content for vegetables. A good rule of thumb for both: the darker the color, the sweeter the flavor. Or see this Guide to Different Color Carrots. Look for firm, stiff, unbending carrots. Any give shows a sign of age and "wilting." If you buy carrots with the greens attached, look for fresh, bright green tops. Once home, however, remove the greens and store the carrots loosely wrapped in plastic in the fridge. Fresh carrots will keep for several weeks properly stored. Carrots are tasty scrubbed clean and eaten raw. With young, fresh carrots, there's no need to even peel them first, their peel is thin and tender. Or make a simple carrot-centric salad by shredding carrots on a large hole grater, tossing with a bit of white wine vinegar or cider vinegar and sprinkling with salt. Roasting carrots with a bit of olive oil and a sprinkle of salt (a drizzle of orange juice is nice, too) at about 350 until tender brings out their deep sweetness. See Roasted Carrots for a full recipe. Carrots are also great thrown into stews or roasted in a pan with chicken or pork.